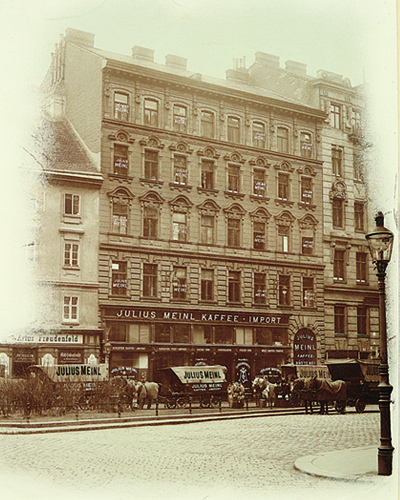 The Julius Meinl story begins in 1862 when Julius Meinl I. opened his grocery store, selling spices and green coffee in the center of Vienna, Austria. He was the first to offer freshly roasted coffee for sale. He had found a new market and his innovation saved customers the challenge of roasting green coffee beans on their kitchen stoves. Selling his coffee roasted guaranteed a constant, reliable quality coffee. This innovation was accepted by the Viennese public with enthusiasm and brought him the success on which he built his business. In 1891 Julius Meinl opened a roasting plant on the site where the retreating Ottoman army had left behind sacks of green coffee beans over 300 years before. Since then 5 generations of the Meinl family have been supplying customers with the world's leading coffees. For more than 150 years Julius Meinl has been Central Europe's best known Coffee Company. Legend claims coffee originated in the Ethiopian province of Kaffa in 850 AD. Both Arabia and the East Coast of Africa were regions owing allegiance to the Turkish Ottoman Sultan. Coffee was brought to Vienna in 1683 by a besieging Ottoman Turkish army. The Fez, a red head-dress with tassel, was worn widely by men in the Turkish lands. When developing the Julius Meinl Logo the Ottoman Fez was combined with the baroque angel widely used in Central European buildings. In 1924 the Viennese artist Josef Binder designed this coffee boy logo. Over the years our logo has been modernized. The red coffee boy with Fez is now the international trademark of the Julius Meinl Group. We value our heritage, expertise and coffee house culture. These are the mainstays of our business. As a family company, our actions are motivated by the entrepreneurial spirit, personal commitment to supply coffees with a consistent taste and quality. More than 150 years of experience and know-how influence the coffee process. Our expertise in purchasing, sampling, roasting and packaging shows itself in each cup of Meinl coffee. We live our mission each and every day. Over 150 years of experience and expertise have offered our customers constant quality of product and services. We seek continuous improvement and drive change. We value our co-workers and encourage their aspirations and diversity. We strive to provide an environment that offers inspiration and personal growth. Julius Meinl stands for premium coffee quality. Wherever possible we purchase organic green coffees, most of which come directly from coffee farms in their country of origin. We traditionally blend our coffees from highland Arabica beans and quality Robustas grown in the world’s leading coffee growing areas: Central and South America, East Africa, Ethiopia, India, and Papua New Guinea. Our coffee buyers and cupping experts apply their highest quality standards. Our roasting and blending specialists in Vienna, Austria and Vicenza, Italy apply their know-how and expertise to satisfy the demand for ecological production and environmentally friendly packaging. Intense aroma, more acidity, more body – Ideal for filter and drip coffee. Brings out the bean's subtleties, aromatic, caramelized, slightly less acidic – Ideal for Viennese coffee recipes. Somewhat caramelized, stronger and more intense taste – Ideal for espresso. Sustainability means long lasting and the capacity to endure. In ecological terms it means the long term protection of our environment. Decisions in our company are made taking into account the long term perspective. It is our conviction that today’s good standard of living must leave the world as beautiful and diverse to future generations. We should consume less and recycle more. The world's peoples, animals and nature in all its beauty and diversity must be allowed to develop freely. We at Julius Meinl in working with the Fairtrade Organisation, Rainforest Alliance and 4C Association who share our dedication to these ideas, are committed to make this happen.